Sliding Scale Information | TNCA, LLC. Sliding scale fee structure. This affords even those who are struggling access to acupuncture. Please honestly pay the rate you can afford. It is the community whole that makes this system possible. 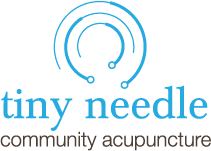 Tiny Needle Community Acupuncture provides high quality acupuncture treatment at affordable rates in a supportive community setting. Please pass along our information to anyone who feels that they cannot normally afford acupuncture. Click here to book an appointment at an affordable rate.